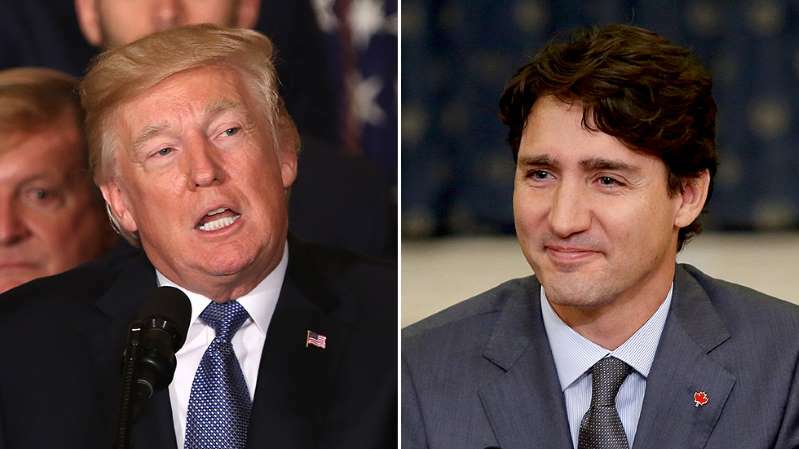 Canadian Prime Minister Justin Trudeau is ripping President Trump over his steel and aluminum tariffs against Canada and other trade allies, saying he does not understand what Trump is trying to accomplish. In a "Meet The Press" interview clip released Friday, Trudeau pointed to the $2 billion surplus on steel the U.S. has with Canada. "The reason I don't know [what he wants] is because he's talked about the fact that he's worried about trade surpluses, trade deficits around the world," Trudeau said. "Well they have a 2 billion surplus on steel with us.So it's not like trade is imbalanced against the U.S. favor on us." Canada on Friday filed a case against the U.S. at the World Trade Organization over the tariffs, which it said undermine "the integrity of the global trading system." Trudeau's comments were aired just a day after he said in a press conference that Trump's tariffs are "totally unacceptable." "Canadians have served alongside Americans in two world wars and in Korea," he said. "From the beaches of Normandy to the mountains of Afghanistan, we have fought and died together." Canada responded on Thursday with retaliatory tariffs of its own on steel and aluminum. The country has said the tariffs will remain as long as the U.S.'s tariffs of 25 percent on steel and 10 percent on aluminum stay in place. Trump responded to Trudeau's criticism early Friday morning, tweeting that Canada has treated U.S. agricultural interests "very poorly" and falsely claiming that Canada has a trade surplus with the U.S. The Office of the U.S. Trade Representative said in March that the U.S. has an overall trade surplus with Canada. Mexico and the European Union, as well as several Republican and Democratic lawmakers, were quick to rip the tariffs on Thursday. France's Emmanuel Macron said the measures amounted to "economic nationalism" and Mexico responded with new duties on various U.S. products.